Is InterServer a good web host? Find complete InterServer review here! InterServer is a web hosting company founded in 1999 by a group of web development professional from New Jersey. InterServer started of by providing only shared hosting service, but over time they have grown to operate two data centers and offer wide range of other hosting services such as reseller hosting, VPS cloud, dedicated server hosting and colocation solutions. This InterServer review will focus on InterServer shared hosting plan. One Click Installs - Using 'One Click Installs' script, you will be able to install a collection of popular website plug-in scripts automatically with simply one-click from the control panel. Example of the 'One Click Installs' scripts that you can install easily are WordPress, PrestaSHop, Drupal, Magento, Joomla, osCommerce... and many many more. Free Migration - If you are hosting your website now at another hosting service provider, you can make use of InterServer's 'Free Migration Service' to move your website to InterServer. Just contact InterServer's transfer team and they will move your website's files, databases, email accounts ..etc to InterServer exactly as it exists at your current web host. This service will enable you to seamlessly transfer your website hosted elsewhere onto Interserver account with little or no downtime. Guaranteed Email Delivery - InterServer offers guaranteed email delivery of valid, non spam, and non bulk emails through the shared hosting service. In another words, email used under normal circumstances will be sent by InterServer from non blacklisted IPs, which constant monitoring once all spam checks have passed. The guaranteed email delivery must pass all the anti-spam checks. Email deemed spammy or abusive will bounce to the sender with the error message. Optimum Server Capacity - There are many hosting service providers out there load their web servers to maximum capacity which causes your website to slow down seriously as a result. However, InterServer only keeps its servers around 50 percent capacity. In another words, your website on InterServer's servers will have more resources at your disposal than you get with many of the other shared hosting companies out there. InterServer provides reliable and secure customer support with 24×7×365 days a year lined with best technical support team who are highly trained and qualified to answer and resolve your queries. Their troll free phone lines are available 24×7 so you can contact them at any time. Apart from this, InterServer also offers 24×7 email support which is a nice platform to interact with experts when you have any queries.
" I compared roughly lots of hosting companies when choosing a new host for my personal website. The InterServer was unsurpassed in price, amount of space, and number of email accounts. I was looking specifically for a host with proven excellence in technical support, because I had a poor experience with the previous company I used. The InterServer quickly provided me with references. I have used their support system quite a bit, and I can tell you that they are responsive, friendly, and patient. I have referred friends who are equally satisfied with the service! " 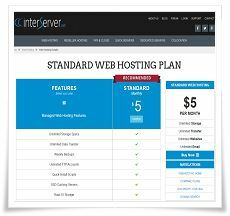 InterServer's Standard Plan is loaded with great hosting features. InterServer is a good option for webmasters looking for website's 'scalability' as InterServer offers various hosting plan from share hosting to VPS Cloud to dedicated	server. As such, you can grow your website seamlessly with InterServer. 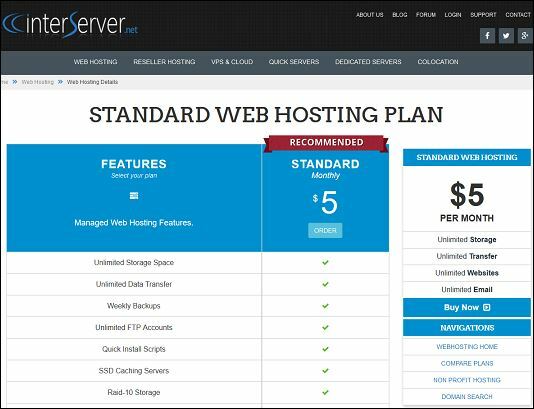 For those webmasters who are looking for monthly paid hosting plan and do not want to be tied down by yearly contract, then InterServer's $5/month Standard hosting plan could be a very good hosting choice.